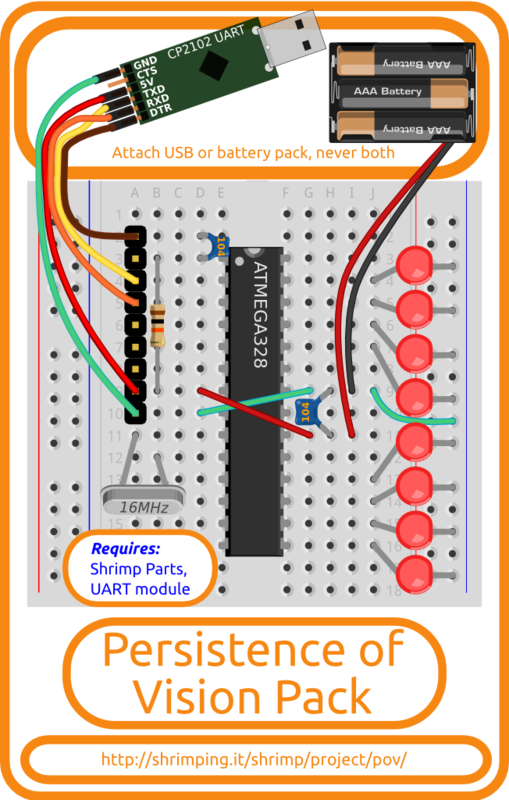 The Persistence of Vision Addon is a pre-bagged kit containing the extra components you need to complete our @ShrimpingIt Persistence of Vision project, a breadboard circuit which can be programmed to paint text and icons in the air as you wave it. The Addon combines with the @ShrimpingIt kits described below (or equivalent parts) enabling learners to follow our step-by-step wiring guide, and then to upload our software examples using the free Arduino IDE. The component and wholesaler information for this project are linked below. Click the Add To Cart button above for pre-bagged kits from our retail bagging service to avoid the hassle of self-sourcing. See the pathways map for a pricing breakdown and to find accessories to build other @ShrimpingIt projects reusing the same components.